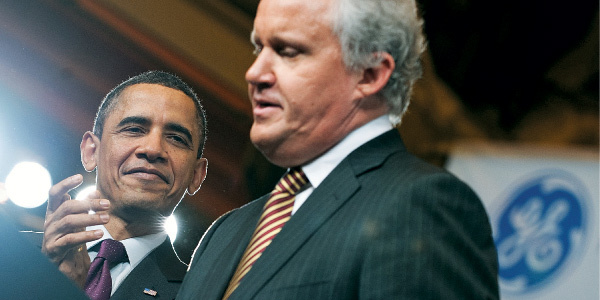 GE is the company of Obama-insider Jeff Immelt, pictured above. GE is also the parent company of the NBC media conglomerate, which has been wrapped around Obama in a love embrace since early in Obama's presidential campaign. GE has been paid back in several ways, for its support of Obama. The most recent payoff comes in the form of an NRC design approval for GE-Hitachi's ESBWR reactor. This favoritism is only a continuation of the cozy relationship between the two persons and their power bases. A GE power plant received a special exemption from new Obama-EPA greenhouse gas rules, for example. GE's Immelt was appointed chairman of Obama's "outside" economic advisers. This puts GE in the driver's seat as long as Obama sits on the throne. The close relationship has been going on for years, however. One hand washes the other, as they say in organised crime, labour unions, and the US Democratic Party. It is a shame to see crucial energy policy used as a political payback tool by the dilettante in chief. But it is nothing more than expected from this political machine.